Sometimes I feel like I’m doing everything at once and I get stressed out. 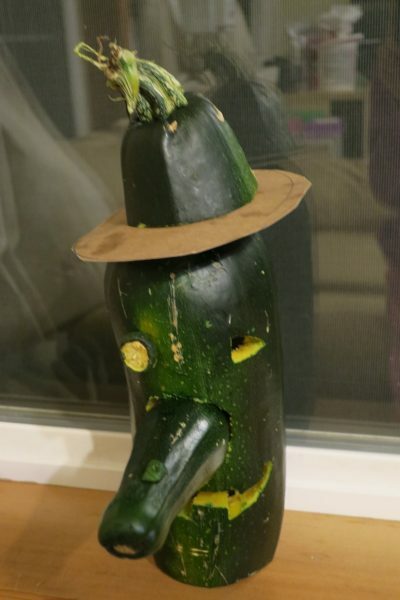 Maggie took jack-o-lantern matters into her own hands when I wouldn’t buy pumpkins and made this awesome witch out of an overgrown garden zucchini!!! I was helping the kids through homeschool and writing and addressing letters. Now I am hoping that everybody is stable, because I want to crochet a washcloth and sit quietly. One of my older, wiser friends once said, “quit should-ing all over yourself” and her excellent advice has stuck with me. Nothing good can come from beating yourself up over all the things you “should have done,” so don’t! It’s a struggle for me sometimes, too, and I really believe for most women. However, I try to remember her quip and turn all my anxiety over to God.